Alcatel One Touch presents its new OS-agnostic PIXI 3 series handsets. Smartphones » Alcatel One Touch presents its new OS-agnostic PIXI 3 series handsets. TCL, the parent company of Alcatel One Touch and an upcoming Chinese manufacturer, has announced the release of PIXI 3 smart phones, the successor of PIXI released in 2013 and PIXI 2 that hit market in 2014. 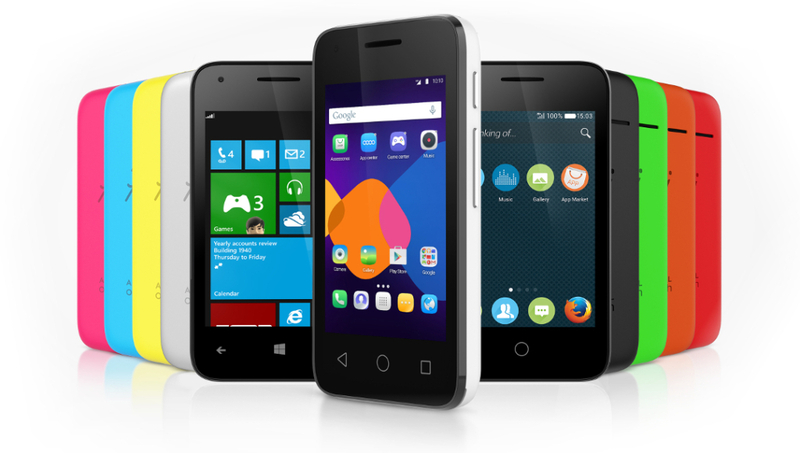 Alcatel’s new PIXI 3 series is catered with a range of three operating systems: Firefox, Windows and Android where the old PIXIs were focused only on android. The buyers of new PIXI 3 can choose their favorite OS from the three at the time of purchase. Alcatel One Touch is excited to show off its new smart phones along with its first wearable Wave smart watches at Consumer Electronics Show 2015 in Las Vegas. The new series comprises of four different screen size handsets: 3.5, 4, 4.5, and 5 inches. PIXI 3 series is the first among the PIXI phones to support 4G.All the handsets except 3.5 inch model will have 4G LTE support built-in. This smallest model in the series will only allow 3G connectivity. PIXI 3 comes along with many popular applications pre-loaded and another feature is easy customization. PIXI 3 of Alcatel one touch is an effort to make the system less complex. In this series of smartphones users are given an option to stay back with familiar work environment in their office and thus facilitating cross-device integration to PCs from smart phones It seems that the PIXI 3 smart phones comes in a variety of colors .The 3.5 inch model comes in pink, blue, yellow, and white. The 4-inch version will be available in red, orange, green, and black. More colors are expected as well. The detailed specifications of the phone are not revealed yet. The prices are speculated to be affordable since the brand is a budget phone maker. The highlights that the users can have the same operating systems at work and office and expected competitive pricing, for which the company is popular for, together with the high speed data connection support built-in makes the tech enthusiasts hope that PIXI 3 will reach far. But the chances are that these pocket friendly phones will fall in low tier category compared to similar smart phones. The company had made phones running on all the three operating systems which PIXI 3 claims to support. Alcatel was the first company to launch processor. This new innovative and affordable product is expected to increase the popularity of the company in Western markets. Google Launched Nexus 5X and Nexus 6P loaded with Nexus Imprint, Type-C USB and so on..